But through more than five decades of presidents and candidates and lofty rhetoric and results, both brilliant and dismal, and billions upon billions of campaign dollars donated and spent, there’s never been a presidential election quite like this one. And we’ve only gotten started. I am confident that by November, what we’ve seen so far of the Clinton vs. Trump gymnastics for the prize of “leader of the free world” will look like the cast of Sesame Street warming up for Howard Stern. This year, I believe we’ve reached a tipping point in American history where the electorate is fed up with the business as usual of political parties. The electorate wants change. Real change. Not soaring rhetoric. Not slogans. But this is not about politics or Democrats or Republicans – per se. It is about history. About responsibility. And it is about my dear friend, Bill Hume. I’ve known Bill for most of my adult life, since he and I were both engineers at IBM in the little upstate New York town of Endicott. And Bill’s wife, Patricia, who readers of this blog know well, was in IBM procurement. Patricia and I were assigned to the same product, and our families became close in the days when peanut farmer/Navy submariner Jimmy Carter was handing the reigns of power over to a former actor and California governor. So let’s start with some history. It’s been about two-and-a-half centuries since the early settlers of the British colonies of America were getting serious about independence. But the cause of independence was not universally embraced. In fact, the chasm between those loyal to Britain and the radical upstarts rallying for liberty was broad – but relatively balanced on each side. Not all believed that being severed from the lifeline of the British Empire was a good thing – just as Scottish citizens are similarly torn todaybetween life within or outside of the United Kingdom. And even among the colonists advocating independence, there were wide and emotional rifts across the differing factions. On one side, the brilliantly radical Thomas Jefferson, who so feared the power of a central government and advocated for the rights of the individual states. Spearheading the side in fierce opposition to Jefferson and his “states rights” were the Federalists, headed by Alexander Hamilton, who believed in a strong central government and central bank. 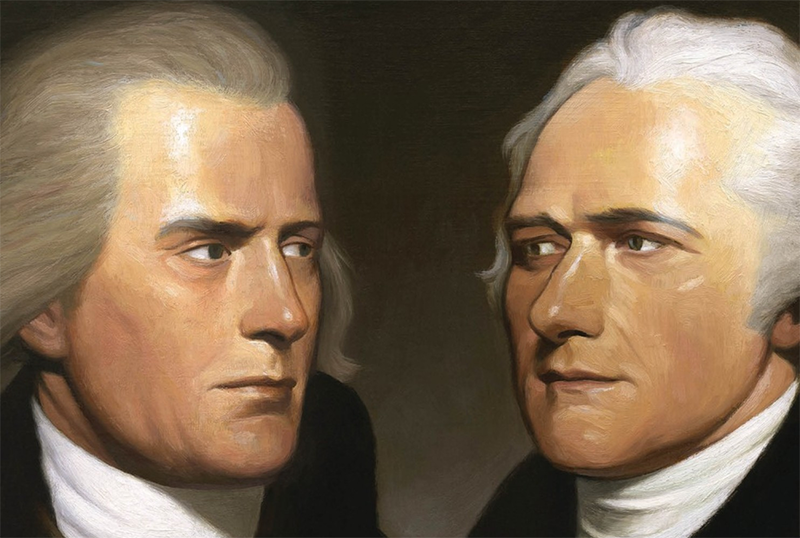 But whether you were a Jeffersonian Populist or a Federalist, you can bet that those guys took the time to know what they were talking about. They listened. They studied. They read. They wrote. As they needed to.Their lives depended on it. Now, back to Bill Hume. Bill and I are as far apart on the political spectrum as any two individuals could be. But if I want to engage in a discussion about politics, as I often do – about the issues, the candidates, the substance and the nuance – there is no one on the planet with whom I’d rather engage than Bill. Why? Because Bill understands his responsibilities as a voter. He appreciates the sacred blood sacrifices that were made centuries ago to earn him that right and privilege to vote today. And in acknowledgment of the blood that was spilled to allow him to select his own leaders, Bill honors his vote by working. He reminds me of those brave patriots on both sides of the 18th century aisle who believed that in order to honor their vote, they had to work. Like they, Bill knows what he is talking about. He listens. He reads. He writes. He acts responsibly. Not because it is the conventional wisdom. He does not simply wave a banner or sport a bumper sticker. And he certainly does not act selfishly for what he believes is best only for him. Instead he acts on what he believes is best for our country. While I wasn’t the biggest JFK fan, he did nail it when he said, “Ask not what your country can do for you, but what you can do for your country.” Similarly, every time I engage with Bill in politics, I learn something. I get a different perspective on the issues. I realize where I’ve been short-sided, or haven’t grasped the breadth and complexity of an issue. Bill and I certainly will never agree on all of the issues, or on all the candidates. Far from it. And that is what makes America so special. I’m sure that while Jefferson and Hamilton rarely saw eye to eye, there was mutual respect. I so admire Bill’s diligence in approaching the voting process. His passion. His insight and analysis. And especially his patriotism. And I’m certain that if 10% of our electorate treated our responsibility with the same sense of awe that Bill Hume does his, we’d have two very different candidates today. And it’s too bad we don’t. Our lives depend on it.